Drain Lids are available in various spans and load bearing capacities. These can be provided with holes for storm water drainage. Often trench and drain covers fail because they are not specified properly for the application. Doing the job right, requires knowing two important factors specific to the application. First, measure the internal span of the drain. And second, estimate the maximum load the cover is going to experience during its operating life. 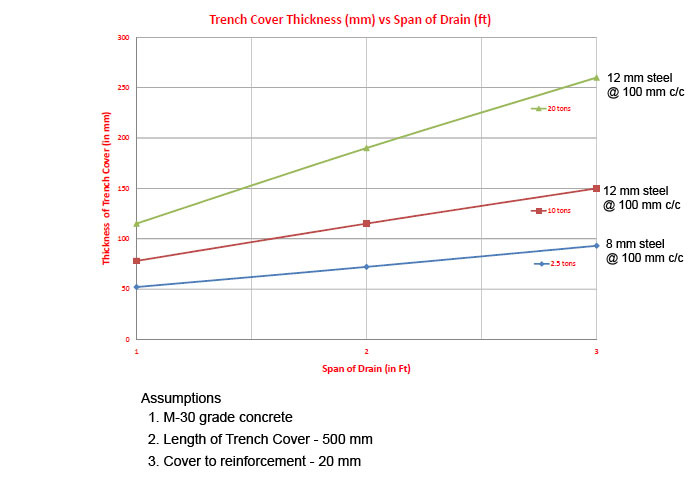 Next, use the chart below to determine suitable thickness of the cover and reinforcement required. Note that since the chart below is prepared for solid covers increase the specifications if there are holes in the cover for drainage. More is the number of holes, greater would be the change to the specification. Lastly, ensure that the cover has a proper seating. The length of the seating can vary from 2 to 4 inches based on the application.